March 22nd is World Water Day, a day of international observance urging people across the globe to learn more about water related issues and become inspired to take action and make a difference. So how is Frontiers North Adventures celebrating World Water Day? By taking a pledge to boycott plastic water bottles on all of our Churchill tours. 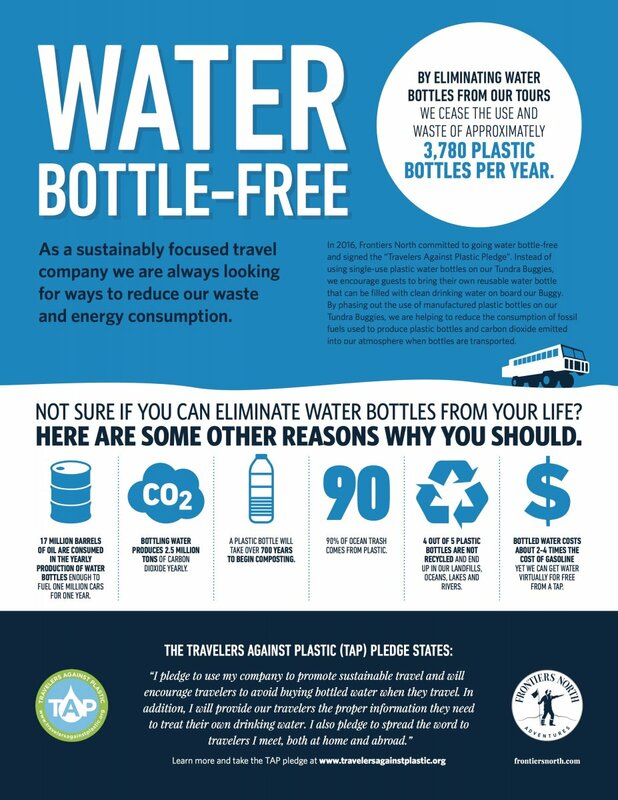 Frontiers North committed to going water bottle-free in 2016. Instead of using disposable plastic water bottles on our Tundra Buggies, we encourage our guests to bring their own reusable, sealable travel mug that can be filled with clean drinking water (or hot coffee or tea) on board. By phasing out the use of manufactured plastic bottles on our Tundra Buggies, we are helping to reduce the consumption of fossil fuels used to produce plastic bottles and carbon dioxide emitted into our atmosphere when bottles are transported. On top of all that, we’re keeping plastic out of landfills! For more info on TAP and everything they do, check out their homepage and sign their traveler pledge. Learn more about Frontiers North Adventures' Social Responsibility.